Although he picked up the first prize at an Olympic-themed stamp exhibition in Sydney in 2004, collector Li Jingbo, from Changzhou of Jiangsu province, remained unsatisfied with his collection Cycling as a Sport. Now he's happy: His collection won him both a gold medal at the 2008 Beijing Olympic Expo Stamp Exhibition and an International Olympic Committee award as well. With nearly 1,000 stamps collected from more than 120 countries, Cycling as a Sport vividly depicts the timeline of bicycle history, including 59 extremely rare bicycle-themed stamps issued before the 1900s. The most eye-catching include four German stamps from 1887, a German stamped envelope in 1891, a miniature sheet from Algeria, and a stamped postcard from the 1928 Amsterdam Olympic Games. The 70-year-old collector is a devotee of sports, especially enthusiastic about cycling. 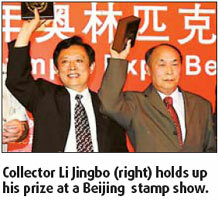 To perfect his stamp collection, Li has toured 31 provinces and regions since 1980s. He once found an entire cover sealed with nothing but "Tour de France". "It was quite cheap, less than 100 yuan. But I didn't understand words and didn't realize the real value of the stamp at that time," Li recalls. He did not keep the stamp and years later he finally got to know that the stamp was issued in the 1950s and was worth 450 yuan ($65.9). Li's devotion and experience in stamp collecting has won him great reputation among Chinese collectors but he still has more ambitious plans to expand his collection. "I'm planning to cycle in Hong Kong, Macao and Taiwan, where I will look for more rare stamps to enrich my collection," he says.